Harvest season in Kentucky is on. We have visited one apple orchard already, and plan to visit another farm next week with play mates. While visiting these beautiful places in our home state we have begun to weave stories. Currently we are digging into the Four Processes of Waldorf Math. W, who is 7 1/2 helps to spin stories about gnomes and apples. Addition, or Plus, the Green Gnome is busy collecting and adding all the apples for the Gnome Kingdom. Subtraction Gnome, or Blue Gnome, is busy Taking Away or Subtracting rotten apples. Multiplication Gnome, or Yellow Gnome is the Record Keeper. After his helpers have grouped the apples in baskets, Yellow Gnome Multiplies all the apples for the Kingdom’s records. Divide, the Red Gnome will be in charge of Dividing the apple bounty to the Kingdom. To help with manipulatives W has sewn four gnome hats, with pouches for gemstones. 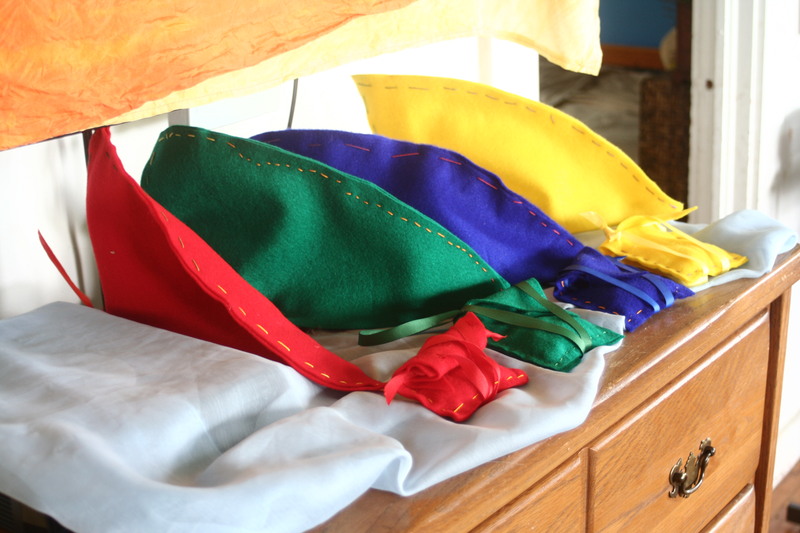 Taking a full week to sew these four hats and pouches has helped to foster a sense of worker’s pride with W. These gemstones represent the apples in our stories, and he uses them to practice achieving the answers. For example, when learning multiplication today we focused on the ways we can make 12. 12 = 6 x 2 and 12 = 4 x 3, 12 = 3 x 4 and 12= 2 x 6, 12 = 12 x 1 and 12 = 1 x 12. Whole to parts. Adding and Subtraction was pretty easy, but Multiplication is bending W’s brain a little. I am trying to keep W knitting one row a day to allow his brain to cross the midline and stretch his sense of learning. 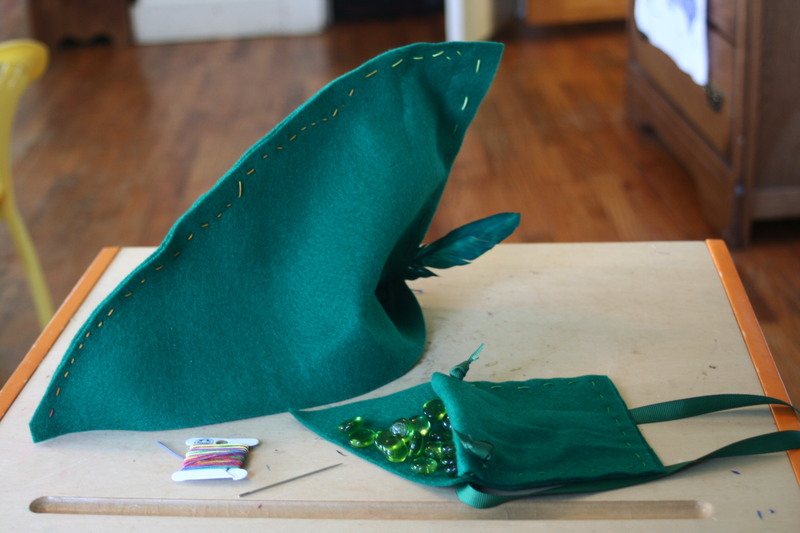 Sewing the Gnome hat and pouch instills a sense of worker’s pride. I am introducing all the four processes at once to create a little freedom, although we are working one by one right now to find a deeper understanding. Once we have finished with Divide, we will continue to spin stories in the Kingdom, allowing for each of the four Gnomes to contribute an answer to any possible story problem the + – x / run into. Right now we are entering our math problems and word problems, such as twelve equals one times twelve into our practice book. Soon we will draw some detailed pictures with math problems into the Main Lesson Book, which is W’s portfolio book for first grade. To get ourselves ready for math, we are spending Circle Time speaking and singing verses and saying tongue twisters for oral dexterity. More about Circle Time in another post. In the Kingdom there are other things going on too. Not only are the Gnomes collecting apples during Harvest Season, but the Kingdom is getting ready for the Michaelmas Festival. Archangel Michael, St. George, the Knight and Dragons all coming up in September. Stay tuned for a month of crafts, stories and more.